If you have more than one device, it’s a good idea to add them in the device list for quick access in the future. To do so, choose File – Manage Devices. If you only have one device or do not wish to store device details, choose File – Quick Connect. In both cases, you will be asked for a host name and the credentials for your devices. It is important to understand that the software uses SNMP to access network equipment, which means only managed hardware is supported and it must have SNMP enabled. To add a device, or a pair of devices click Add in the device manager. 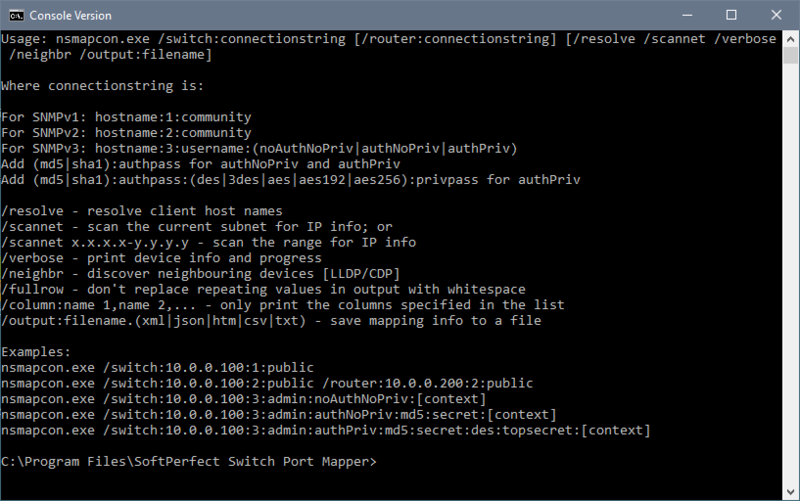 Enter the host name of a switch whose port mappings you want to receive. 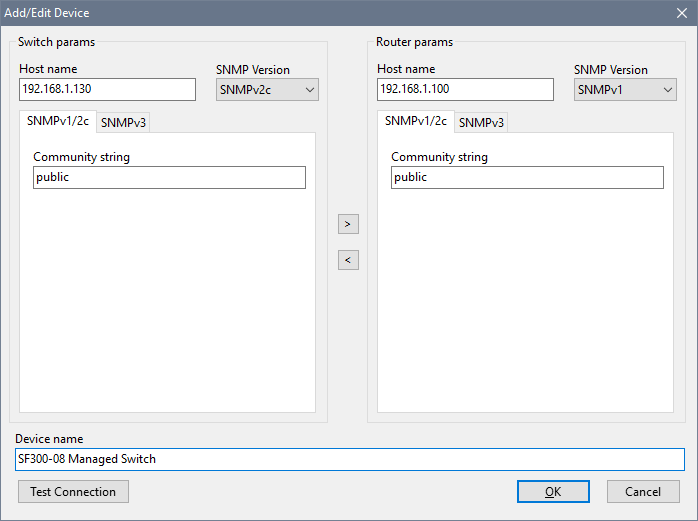 Then choose an SNMP version that your switch supports. It is recommended to choose SNMPv2c or SNMPv3 wherever possible as these versions of the protocol support bulk operations. For SNMPv1 and SNMPv2c you will need to specify a community name. It acts like a password for the device access. For SNMPv3 it is a bit more complicated. The third version of the protocol supports secure authentication and data encryption. You will need to choose a cipher, a hash algorithm and one or two passwords, depending on the required security level. If you require IP information to be displayed, you can also specify a router (see the Getting Mappings section below for details). The Quick Connect panel allows you to pull switch port mappings without having to store it in the device list. In this case there is no need to choose an SNMP version. The software attempts to connect to the device(s) with SNMPv2c and if it fails, it uses SNMPv1. 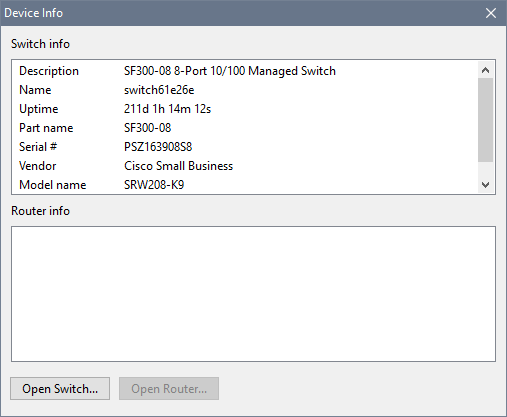 Once you have configured your switch’s connection details, and optionally your router’s, you are good to go. So click Go. The software will connect to the switch and pull a list of available ports, their speed, duplex status and other information. It will also pull a list of MAC addresses connected to each port. 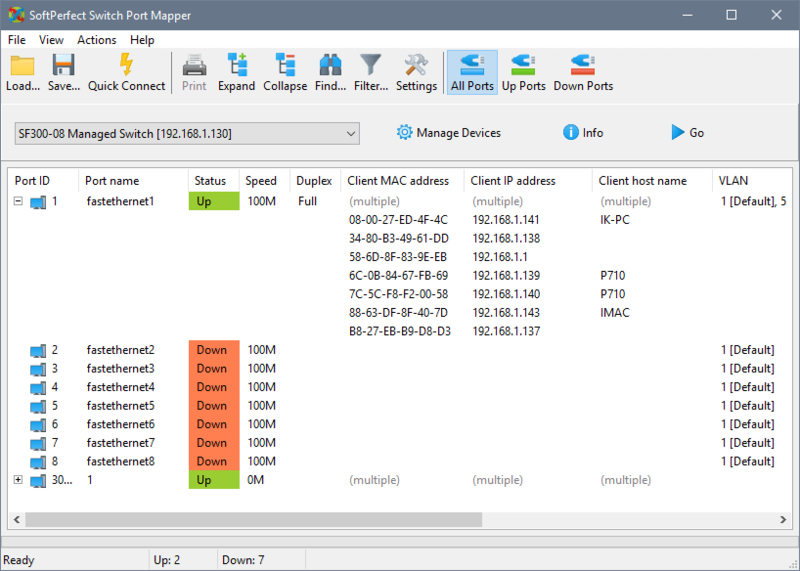 After that (in fact, in parallel), the software will either connect to your router if you have configured it and pull a list of IP-to-MAC address mappings, or scan the current subnet for this information. 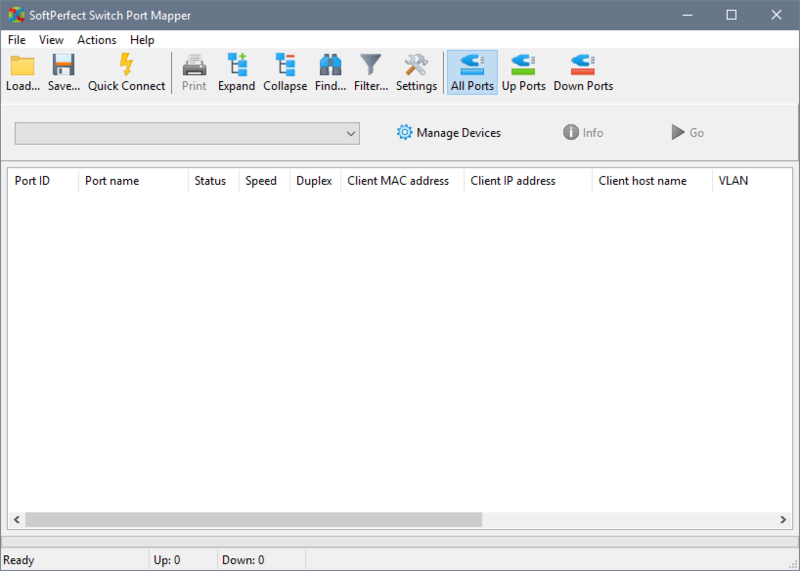 Once the Port Mapper has retrieved the required information, it cross-references the received data. 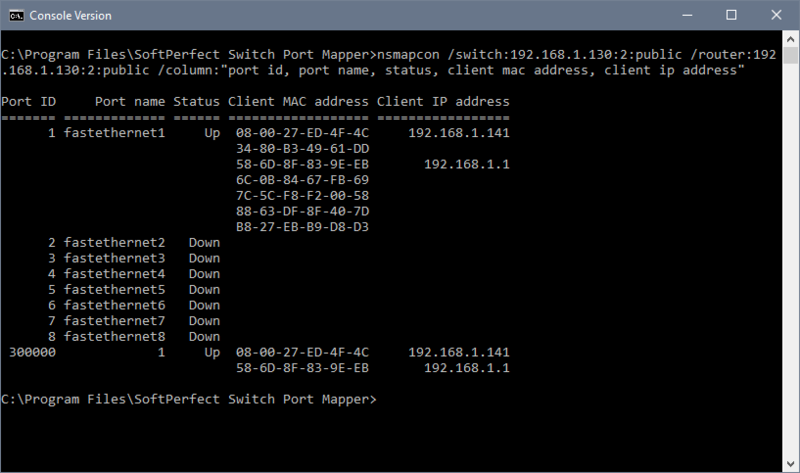 The list of MAC addresses received from the switch is matched against the list of IP-to-MAC address mappings. At the final pass, those IP addresses are resolved into host names. If there is no mapping information for a specific MAC address, you will only see Client MAC address, without IP information or host name. More applications can be added in File – Settings & Preferences. 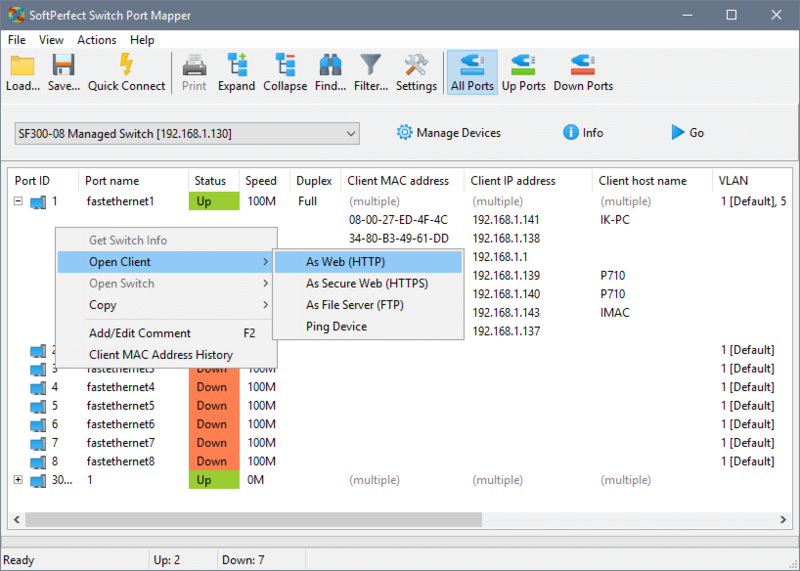 The software allows you to have comments assigned to an IP address, MAC address or a switch port. Right-click a row and choose Add/Edit Comment to add or update a comment. Comments assigned to a MAC or IP address are treated as global. You will see the comments, even if these MAC or IP addresses are pulled from a different switch. Comments assigned to a switch port are specific to that switch. Launching the console version without parameters displays parameters syntax. In this example we retrieve the same information using the console version. In the GUI version, a licence key to remove the trial restrictions can be entered in Help – Enter Licence Key. To apply a licence key to the console version, copy the key’s contents between the tags as shown below and save it as a *.key file with the same name as the console executable. Usually it will be NSMapCon.key.